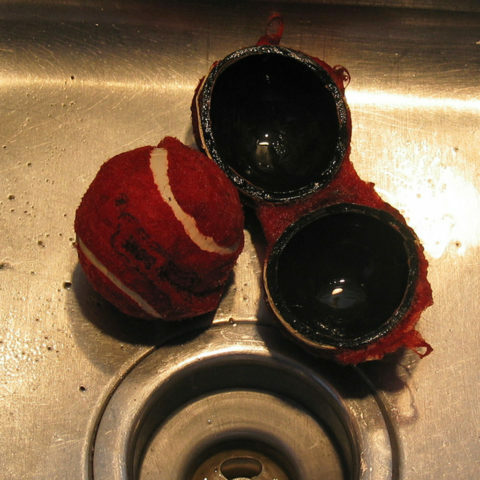 Most people are not aware of the fact that tennis balls can actually be dangerous to dogs. The danger is that when playing fetch with your dog, the ball could get stuck in your dog’s throat when he catches it. Once the ball gets stuck in your dog’s throat, it blocks off his breathing. If not taken care of quickly, your dog may not survive. This dog tennis ball danger tends to be most common in larger breeds like German Shepherds, Golden Retrievers and Labrador Retrievers. The reason: those breeds are more likely to enjoy catching and playing intently with balls. Plus, their mouths are large enough to entirely wrap around a tennis ball. That said, this dog tennis ball danger applies to any dog of any breed. If a tennis ball could get stuck in your dog’s throat, then he is at risk of choking on a tennis ball. Balls rank #5 on this list of the top 10 foreign objects pets ingest by accident. If you find your dog choking on a tennis ball, you need to act quickly. The first thing you need to do is get your dog, and if he’s a big dog, then straddle him. Open your dog’s mouth. If you are able to reach the tennis ball, grab it with your fingers to remove it from your dog’s mouth. On the outside of your dog’s throat, roll the ball up his throat and into his mouth. Then, open your dog’s mouth and once the ball is within reach grab the tennis ball. Just remember the faster you get the item unstuck and out of your dog’s mouth, the better your dog’s odds of surviving. If your dog has something stuck in his throat and cannot breathe at all, then chances are you don’t have time to get to the vet. It will be up to you to save your dog’s life. If someone else is in the house, yell for them to assist you in getting the item out of your dog’s throat. The lesson here is this: If your dog isn’t breathing, don’t go looking for help — because once you find help, it may be too late. Here’s how to do dog CPR. While neither of my little dogs has choked on a tennis ball, I did have a scary choking situation with my oldest dog one time. I had left her outside for awhile, and when she came back in it was clear that she was choking on something. As soon as I opened her mouth, I saw something stuck sideways at the opening of her throat. Once I got the item unstuck and out of her mouth, I realized it was a leaf stem. Come to find out, she was chewing on a leaf while she was outside and the stem got stuck in her throat. A choking dog is a very serious situation. Smaller dogs tend to choke on smaller things. 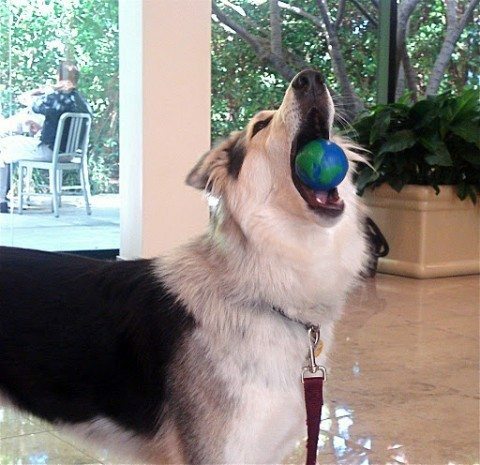 Larger dogs tend to choke on larger things… like tennis balls and golf balls! 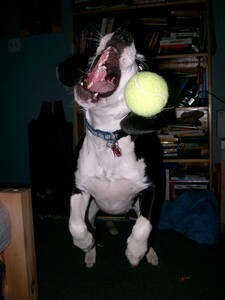 Other common dog toys that rank right up there with the dog tennis ball danger are squeaky toys! Some dogs will tear apart squeaky dog toy just to get the squeaker out of it. This squeaker can be a choking hazard for dogs. Also, the stuffing and any removable parts (like eyes) can be a choking hazard to your dog as well. Balls of other shapes & sizes, like the Kong ball. Not all chew toys are safe for dogs. So, it’s not just the matter of dogs chewing on tennis balls — which, in itself, can be destructive to the inside of the dog’s mouth and teeth. 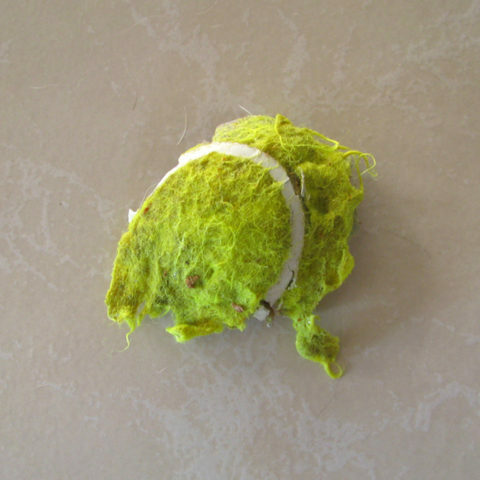 The bigger issue is the fact that tennis balls (or even pieces of tennis balls) can get lodged in a dog’s throat or in a dog’s stomach and wreak havoc. There are alternatives to standard tennis balls. 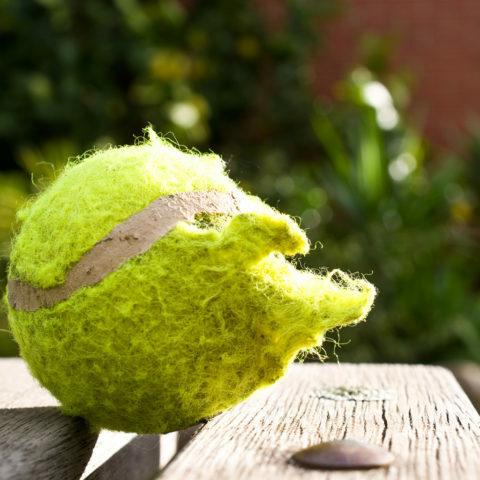 Some have dog-friendly coatings and are safer for dogs who like to chew on tennis balls. Still, you should think of tennis balls and other dog toys just as we do when buying toys for children. If the item would entirely fit within their mouth, then it’s not an appropriate toy. Typically, that means that larger breed dogs should not be playing, unsupervised, with standard size tennis balls. Larger tennis balls made just for dogs are better — like the large Kong Squeakair tennis ball. 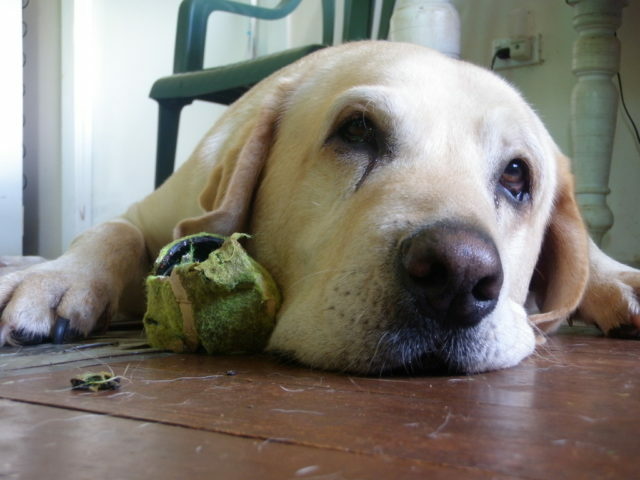 Check out this Dogs and Tennis Balls FAQ.